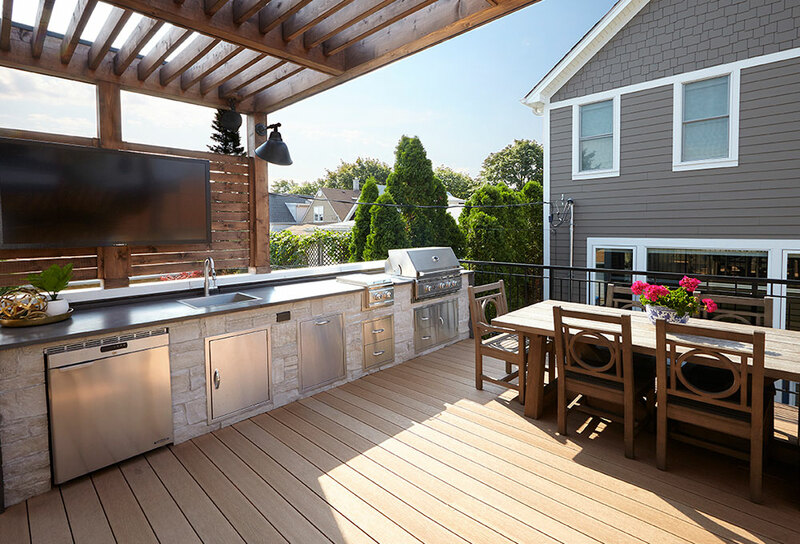 This homeowner approached us looking for a simple and clean layout for their garage roof deck. They wanted an impressive outdoor kitchen that would match stylistically with the rest of their Craftsman style home. We achieved this by cladding the entire outdoor kitchen in a light stone material, installing all stainless steel appliances, and finishing it off with custom concrete countertops. Additionally, the client wanted a structure that would offer plenty of shade and privacy while not making them feel like they were boxed in. This cedar pergola with cedar slats along the wall was the perfect solution to their needs!